A Kansas City newspaper suggested an avian theme for Valentine’s Day parties in February 1900 like the one described below. Minty stepped back from the dining room table that she’d just finished setting with Mama’s best china in the rose pattern . . .
A pair of turtledoves made of stuffed cotton and feathers hung from the two chandeliers. In the middle of the table sat an elaborate nest made of interwoven twigs and filled with hard-boiled eggs. More eggs would follow for the dinner since after all Valentine’s was the birds’ mating day . . . In front of each plate stood a place card Peach and Eddie had made in sets of two: pairs of doves and canaries to sit on the side of the table closer to Minty, larks and blue jays on the other, and cardinals split between the head and the foot of the table. Minty patted her pocket that held the folded red paper heart Peach gave her when she got home from work in the afternoon. On it Eddie had written a verse about blue jays, not Minty’s favorite birds, too noisy, but she had to admit their plumage was lovely . 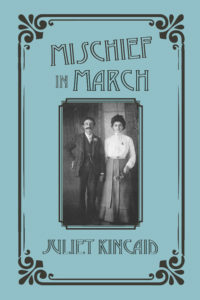 . .
Mischief in March is here! That night, after saying, “And there’s no time like the present to start,” Minty removed his tie and unbuttoned his collar and his shirt down a button while he stood there like a lamb, even when, on tiptoes she kissed him on his neck where it curved down into his left shoulder. Instantly she discovered that the manly Mr. Price was as ticklish as a little boy in that particular spot. He sounded just as silly as a kid when he giggled, too. And so there was nothing for it but for her to yank his shirttails out, reach under his shirt, and tickle his ribs, thus reducing him to helpless laughter on the floor. Of course Minty’s discovery required that Daniel be permitted to look for the ticklish places upon her person as well. It was only by the firmest discipline and the thickness of her corset that she remained unmoved by those attempts. In the days since Valentine’s Day, what Daniel came to call their improper courtship and their mutual investigation into each other’s physical persons had progressed from tickling to kissing to general, all-purpose canoodling, and finally to examining each other’s scars. Minty started that phase of the investigation by showing Daniel the curved scar on her left index finger she received when she first tried to skin a potato with a paring knife. And then Daniel rolled up his right sleeve so Minty could see the scar on his bicep he got tangling with the barbed wire on a fence in his flight away from a neighbor’s pumpkin patch one fall night long before. 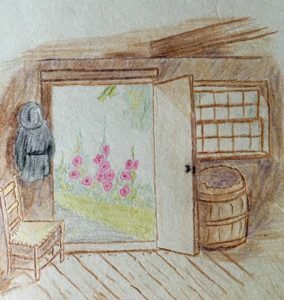 In the weeks following, she pulled up her skirt, rolled up her pantaloons, though only as far as her knees, and rolled down her left stocking so he could touch the deep pit on her shin she got when she fell on a rocky hillside back home at the ranch. She also let him examine the scar on the edge of her right hand that came from tripping on a paving stone, dropping a jelly jar she was carrying, and hitting a pointed shard of glass with her hand. He in turn over the weeks guided her discovery of his scars . . .
Now, on the evening of March Fourteenth, when they returned to the Wilcox parlor from their fruitless search for Miss Shackleton’s will, they lit only the lamp on the table in the center of the room before they retreated to the sofa in the shadows. This served as a preventative measure so they could set themselves to rights in case someone burst into the parlor without knocking on the door and caught them in disarray. That evening, Daniel sat so close to Minty in the corner of the sofa a gnat couldn’t squeeze between them. His left arm lay across her shoulder and his mustache tickled her cheek. Minty had thought Daniel had no more injuries to investigate until she reached into his shirt he’d unbuttoned for her that night and felt yet another scar on his collarbone on the right side. “What’s this?” she said. As their wedding day rapidly approaches, Minty Wilcox still has many questions about her fiance, Daniel Price. Could he really have killed a man? What else is he hiding about his past? Why has he never told her he’s rich? And for goodness’ sake, where are they going on their honeymoon? 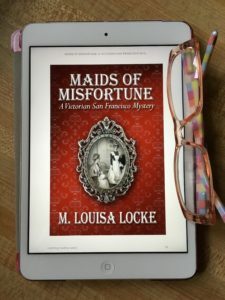 Praise for Fatal February Book 2 of the Calendar Mystery Series. 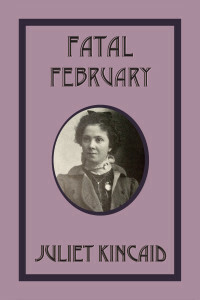 The first chance Minty Wilcox gets in January 1899, she sets off to find a stenographer’s job in Kansas City. But her search is jinxed from the start. And in spite of her efforts to clear her name, eventually bad luck spreads like a nasty cold from Minty to her mother, her brother, her younger sister, and to Mr. Daniel Price, their mysterious lodger, as well. Minty feels that she brought all these troubles to her family and friends, so she must set things right. This won’t be easy in Kansas City where, a hundred years or so ago, living could get downright deadly. I just had to share the encouraging review that Judge 16 wrote for January Jinx that I submitted to the Writer’s Digest contest for self-published books this year. The delightful, creative, and charming January Jinx introduces a terrific character in Minty Wilcox, a good old fashioned cozy mystery persona who will surely be able to carry the planned-for series. It’s Minty who drives the readable narrative, and author Juliet Kincaid keeps the pace steady and fast at the same time for quite a readable experience. The writing is appropriate for the historical setting without ever being gimmicky or archaic. The book is definitely good enough to deserve a better package. The cover and bound-manuscript interior of the book itself doesn’t do justice to the narrative. Likewise, a more thorough copy edit would have helped trim out some of the manuscript aspects of it, like underlines instead of italics, and other typos, etc. could have been smoothed out. 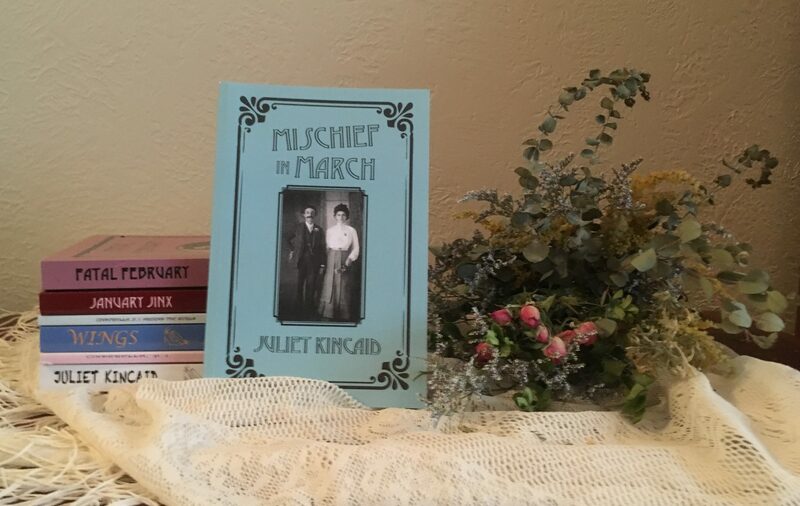 The plot is a bit expected though not predictable, and as long as Juliet Kincaid allows herself to mature as a storyteller, readers will follow her through this book and onward. The unique setting of 1899 Kansas City is full of flavor that never overwhelms the story and characters. 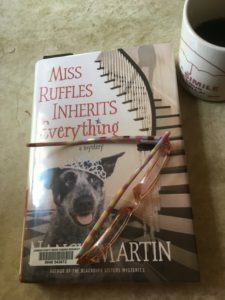 With a terrific, original, but still comfortable series concept, there are certainly big things afoot for Juliet Kincaid and Minty Wilcox’s Calendar Mysteries. Isn’t this a great review? Thank you so much, Judge 16, for your encouraging review. 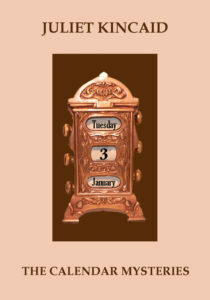 In case you’d like to check January Jinx out for yourself, here’s the link: www.amazon.com/dp/B00HSSSBE4. 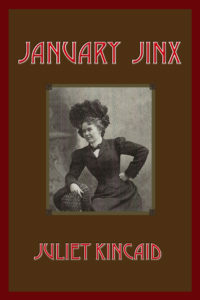 January Jinx is also available as a trade paperback from Amazon.com.